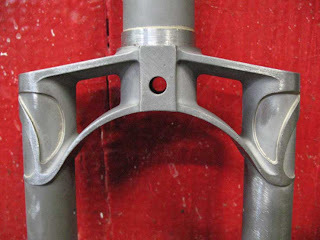 Here’s some pictures a recent fork built with Kirk Pacenti’s new fork crown. I don’t know if it has a name. The crown is wide. 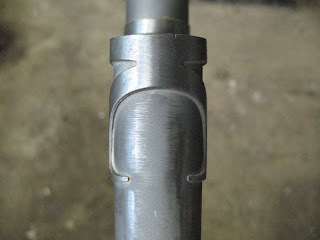 The blades are 70mm apart at the base of the crown. The fork seems ideal for rigid mountain bike forks. The steerer is 28.6mm. Aesthetically the crown reminds me of the cool faux twin plate crowns used on Bridgestone mountain bikes. Don’t ask me what it weighs. I didn’t put it on a scale. I don’t normally make many mountain bikes but I could see using this fork crown in the future. It’s nice to have options.